There are more types of detox diet than you can count, and some of the most popular are based around various homemade soup recipes. 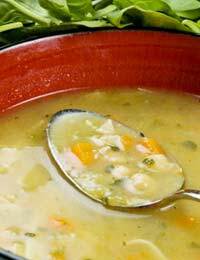 The most famous of these is the cabbage soup diet, widely regarded as an effective quick-fix detox and weight loss program. We take a look at what’s involved in a soup detox. Depending on the particular plan you follow, a soup detox may involve eating only soup, or soup with one other type of food chosen from a carefully planned list. Made from various vegetables (excluding potatoes), a detox soup is easy to cook at home, and though vegetable-based, you are free to add more substance in the form of herbs and spices. Most plans allow you to eat as much soup as you like throughout the detox, so although you may become bored, you shouldn’t be hungry. How long should I follow a soup detox? Due to their restrictive nature most soup detox diets last for up to a week. You’ll be existing on a very limited number of calories so it’s not a good idea to continue your plan beyond seven days. Some plans advocate following a soup detox for a few days every month to maintain the benefits. As with any restrictive diet plan you should ease yourself in and out of it gently, reintroducing food slowly so as not to labour your system. What are the benefits of a soup detox? As you might expect, living on a diet mainly made up of vegetable soup will result in fast weight loss, and this is the main reason people undertake such a plan. You’ll also be helping your body to rid itself of toxins since you'll be living mainly on water and very easily digested foods. Think of it as a much needed holiday for your digestive system from processed foods, sugar and fat. You may also notice you have more energy and even clearer skin as a result, though you can achieve a similar effect by upping your water intake. Although a week’s soup detox won’t harm your body, it may well be tricky to fit into your lifestyle. It’s a detox plan best done while you’re at home, rather than work. Since alcohol and treats are off the menu you might as well forget your social life for a few days. You may also find your bowel habits change as your body adjusts to the change in routine. There may be other unappealing side effects, particularly if you follow a cabbage soup diet. That’s another good reason to follow a plan like this at home! If you feel you need to detoxify your body, perhaps after Christmas or a stressful period when you haven’t had time to pay attention to your diet, a soup detox is a good option for you. While there’s no substitute for a healthy, balanced lifestyle, a detox gives your system a good jumpstart that you can build upon when your initial plan has finished.